Iyama defends Tengen title: The third game of the 42nd Tengen title was held at the Munekata Yurix, a leisure complex, in Munekata City, Fukuoka Prefecture on December 1. After the challenger Ichiriki Ryo 7P leveled the series with a win in the second game (November 11), there was a gap of just under three weeks. Iyama (black) felt that he had fallen behind a little in the opening, so he decided to let Ichiriki build a moyo, his plan being to stake the game on living after invading it. The game was actually decided by hectic fighting in the centre. Ichiriki resigned after move 163. The fourth game was played at the Hotel New Awaji in Sumoto City, Hyogo Prefecture on December 12. Taking white, Iyama (right) won by resignation after 188 moves. Facing a kadoban, Ichiriki played boldly, setting up a large moyo. Iyama tried to cut it down to size and the game was decided by a ko fight in the centre. Iyama gave up a group in return for winning the ko, but he secured the lead. This is the last title match of the year, so Iyama ends the year with six out of the seven top titles. He will be just as busy next year defending his sextuple crown and he will be the favorite to become the Meijin challenger. Judan Best Four: The semifinalists in the 55th Judan tournament have been decided. Yamashita Keigo 9P meets Yo Seiki 7P in one semifinal and Imamura Toshiya 9P plays Hane Naoki 9P in the other. Incidentally, Yo beat Ichiriki Ryo 7P in the quarterfinals. 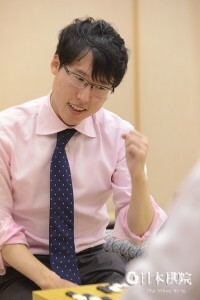 Takao wins 3rd Over 40 Quick Go Tournament: This is a relatively new tournament for middle-aged professionals. It’s in its third year, but this could be my first report on it. As readers of this page will know, Takao Shinji (left) turned 40 during the Meijin title match; since he played in the tournament, the name should read “Over 39” or “40 and over,” but the Japanese name reads “Over 40 haya-go tonamento,” so this is not a mistranslation. The Nihon Ki-in likes the sound of “over 40,” although, presumably, aware of the inaccuracy. (“U20” is used in tournament names in the same way.) In the preliminary, the time allowance is ten seconds a move; according to Takao, this was quite an ordeal for him — not just playing but also pressing the clock within the time. He couldn’t help feelingly keenly how much he had slowed down in reading speed since his youth, though he still won his way through. In the main tournament, the NHK format is followed (30 seconds per move plus 10 minutes thinking time in one-minute units). 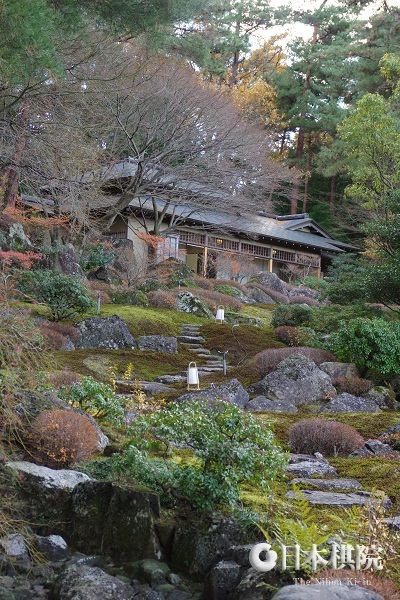 The semifinals and final were held at the Nihon Ki-in in Tokyo on December 6. 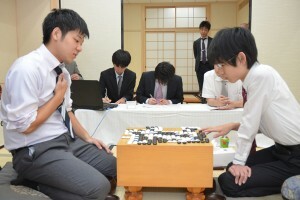 In the final, Takao (B) beat Kato Atsushi 9P by resignation after 121 moves. This was the first time a current titleholder played in the tournament. First prize is 500,000 yen (close to $43,000). The winter qualifying tournament for professional 1-dan was completed on Nov. 19. The top two players in the 16-player Swiss System tournament were Shibano Ryunosuke (aged 19) and Seki Kotaro (aged 15). Shibano is the older brother of Shibano Toramaru 3-dan (aged 15), who has already attracted a lot of attention since becoming a pro in summer last year. Ryunosuke was an insei like Toramaru, but ran into the age limit two years ago. This year he entered university and intended to give up his professional ambitions if he failed this time. 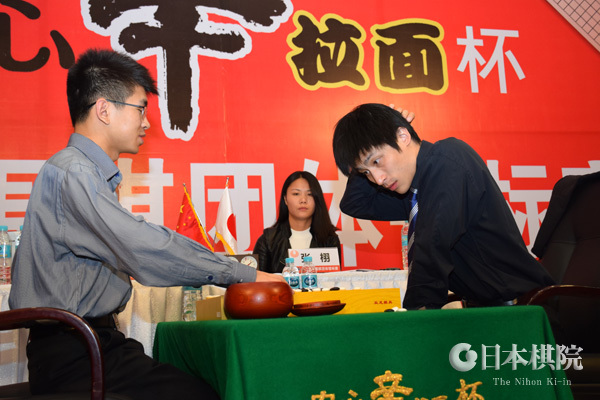 Last year he became the youngest player to win the Amateur Honinbo tournament; he took first place in the qualifying tournament with a score of 12-3 (he lost his first three games), so he can finally set about trying to catch up with his younger brother. Kono to challenge for Kisei: The second game of the play-off to decide the 41st Kisei challenger was held at the Nihon Ki-in in Tokyo on November 14. Taking white, Kono Rin 9P (right) beat Cho U 9P by 1.5 points, so he will make his first challenge for the Kisei title. Kono has won nine titles, but the Tengen is the only top-seven title he has held, though that was for three years in a row. This is only his second big-three challenge; he lost the 39th Meijin title match to Iyama 2-4 in 2014. He will turn 36 on January 7, just before the title match starts on January 14. Ida wins first Crown title: The Crown (Okan) title is restricted to members of the Central Japan branch of the Nihon Ki-in in Nagoya. This year it was held on November 14. Playing black, Ida Atsushi 8P beat the defending title holder Hane Naoki by resig. Surprisingly, the 22-year-old Ida is the first player younger than Hane (40) to win the title. It is his third title: he has also won the Judan and the NHK cup. Hane’s winning run as Okan ended at five terms. First prize is 1,700,000 yen (about $14,500). Iyama defends Oza title: The third game of the 64th Oza title match was held at the Saryo Soen, an entertainment complex, in Sendai City, Miyagi Prefecture on November 18. 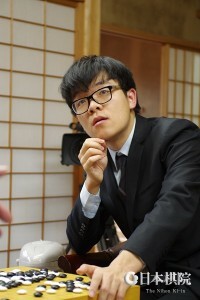 Yo Seiki (or Yu Zhengqi), the challenger, played well with black, but the severity of his attack was exceeded by the power of Iyama’s “shinogi” (rescuing a group). Yo resigned after 122 moves. 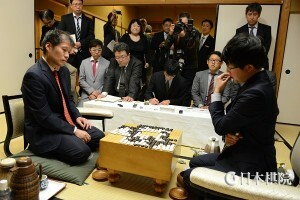 Iyama (left) succeeded in defending his title with three successive wins, so he came through his first major test since his loss of the Meijin title. This maintained his sextuple crown and gave h im his 39th title, putting him in equal 6th place with Cho U.
Ichiriki wins Young Carp: The main tournament in the 11th Hiroshima Aluminum Cup Young Carp Tournament was held at the Central Japan Newspaper Building in Hiroshima on November 26 and 27. Ichiriki (right) was busy with his Tengen challenge, but he still had the energy to pick up this junior title. In the semifinals, Ichiriki beat Fujisawa Rina, Women’s Honinbo, and Motoki Katsuya 7P beat Oomote (pronounced oh-o-mo-te) Takuto. In the final, Ichiriki had white against Motoki and forced a resignation after 156 moves. First prize is 3,000,000 yen (about $25,600). The second game of the “best-of-three” play-off to decide the challenger to Iyama Yuta for the 41st Kisei title was held at the Nihon Ki-in headquarters in Tokyo on November 14. Taking white, Kono Rin 9P (right) beat Cho U 9P by 1.5 points. As the winner of the S League, Kono started off with a one-win advantage, so this secures him victory. He will be making his first challenge for this title. Kono’s main achievement so far has been to win the Tengen title three years in a row. The title match starts in January. Tang wins Ing Cup: The final three games in the best-of-five final of the 8th Ing Cup, a tournament held only in the year of the Olympics, were held in Shanghai on October 22, 24, and 26. Tang Weixing 9P of China beat Pak Jeonghwan 9P of Korea 3-2. In the fifth game, the 23-year-old Tang (B) beat Pak by 5.5 points and won this title for the first time (I don’t have the details of the other games). The Ing Cup is known for its special rules: komi is 8 points (Black wins a draw); the time allowance is three hours, but two extensions of 20 minutes can be bought for two points each. First prize is 400,000 dollars. 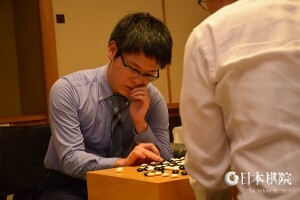 resignation (he now leads Li 2-1), so he met Shin again in the final. Shin (W) won this game by resignation, and Ichiriki took second place. Miyamoto Yoshihisa 9-dan of the Kansai Ki-in dies of liver-cell cancer on October 31. He was 77. Born in Hyogo Prefecture on June 16, 1939, Miyamoto became a disciple of Hashimoto Utaro. He became 1-dan in 1951 and reached 9-dan in 1970. He retired last year. He won the 30th Kansai Ki-in No. One Position title in 1986. He is the younger brother of the later Miyamoto Naoki 9P. but then he was dethroned at the top player by Iyama Yuta. In recent years, he has not featured in title matches. He thought that a change of scenery might improve his form, so he returned home to Taiwan for a while with his wife, Kobayashi Izumi, and their two children. Another motive was to have his children learn Chinese. He has since returned to Japan (I don’t have any dates) and seems to have recovered something close to top form. At present, he is doing very well in the Kisei knock-out tournament that follows the leagues. On October 24, Cho, the winner of A League, defeated Yuki Satoshi 9P, the B League winner; taking white, Cho won by resig. On October 31, Cho, playing black, beat Yamashita Keigo 9P, who came second in the S League, by 5.5 points. That earned him a place in the “best-of-three” knock-out final. In the first game, played on November 10, Cho beat Kono Rin 9P, the winner of the S League, by half a point. The second game will be played on November 14; if Cho wins, he wins the final 2-0; if Kono wins, he will become the challenger to Iyama Kisei because the winner of the S League is given a one-win advantage. 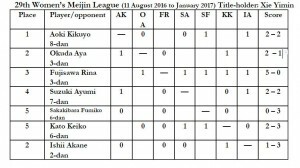 Women’s Meijin League: Two games were played in the 4th round of the 29th Women’s Meijin League on October 27. Aoki Kikuyo 8P (B) beat Sakakibara Fumiko 6P by resig. ; Kato Keiko 6P (W) beat Suzuki Ayumi 7P by resig. Both Aoki and Kato improve their scores to 2-2. On November 7, Fujisawa Rina, Women’s Honinbo, (W) beat Kato Keiko 6P by resig. and kept the sole lead on 5-0. Fujisawa has just one more game to play, against Aoki Kikuyo 8P. Even if she loses it, only one player has a chance of beating her: Okuda Aya 3P, who is ranked no. 2 to Fujisawa’s no.3. Okuda has played fewer games and is on 2-1. If she wins her next three games and Fujisawa loses hers, Okuda’s high rank will give her victory, but the odds very much favor Fujisawa. On November 10, Suzuki Ayumi 7P (W) beat Ishii Akane 2P by resignation. 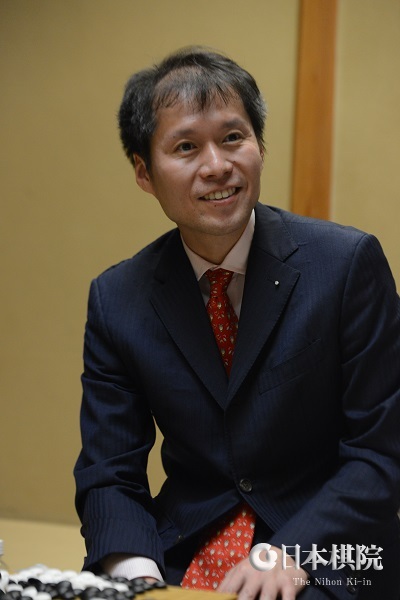 Kobayashi Satoru wins 1,100 games: On November 3, Kobayashi Satoru 9P secured his 1,100th win by beating Ohashi Naruya 7P in the first round of the 42nd Gosei title; Kobayashi had white and won by resignation. With 574 losses and 1 jigo, he has a winning percentage of 65.7. 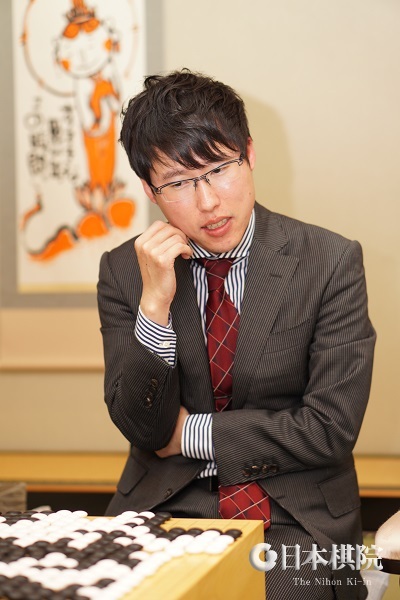 He is the 11th Nihon Ki-in player to reach this landmark; at 57 years six months he is the 7th youngest, and, at 42 years seven months, the 6th quickest. His winning percentage is the 6th best. He has won ten titles, including the Kisei. Takao wins Meijin title, breaks Iyama’s monopoly: After starting with three straight losses, Iyama Yuta had clawed his way back into contention with wins in the fourth and fifth games in the 41st Meijin best-of-seven. In view of his bad record in the past against Iyama, Takao Shinji probably found this an ominous development. The sixth game was played at the Imaiso, a traditional inn in the town of Kawazu, Kamo County, Shizuoka Prefecture on October 26 and 27. Takao turned 40 on the first day of the game, but he didn’t get a birthday present from Iyama. Taking black, Iyama dominated the game and forced a resignation after 185 moves. Takao is known for his fondness for thickness, but in this game centre thickness built by Iyama played a part in his win. Takao was also handicapped by an oversight he made near the end of the game, so he resigned early. Finally, Iyama had drawn even in the title match. The statistics were now slightly in his favor. This pattern of one player winning the first three games and the other the next three had come up in Japanese go ten times previously, and the player staging the recovery had won the seventh game six times. On the other hand, in the most recent five cases, the player who won the initial three games made a comeback and took the seventh four times. Go reporters like these kinds of statistics, but probably the players themselves don’t pay much attention to them. The seventh game was played at the Tokiwa Hotel in Kofu City, Yamanashi Prefecture on November 2 and 3. The nigiri was held again, and Iyama drew black. As usual, Takao built thickness on the first day, then on the second day developed it into a vast moyo based on the top left. Next, he succeeded in reducing Black’s moyo and took the lead. He then parried Iyama’s attempts to catch up by playing thickly and maintained a small lead until the end. White won by 2.5 points after 251 moves. Takao made a comeback as Meijin after a gap of nine years; he had won the title just once, in the 31st term, and at the same time held the Honinbo title. This success was all the more welcome for Takao because he lost two Meijin challenges to Iyama 0-4. He has now won 15 titles. Iyama lost his septuple crown after holding it for a little over half a year — 197 days, to be exact; he lost his monopoly of the top three titles, the Kisei, Meijin, and Honinbo, after 1113 days — he won ten successive top-three title matches. He held the Meijin title for three years in a row and earlier held it for two terms; he needs another five wins to qualify for an honorary Meijin title. 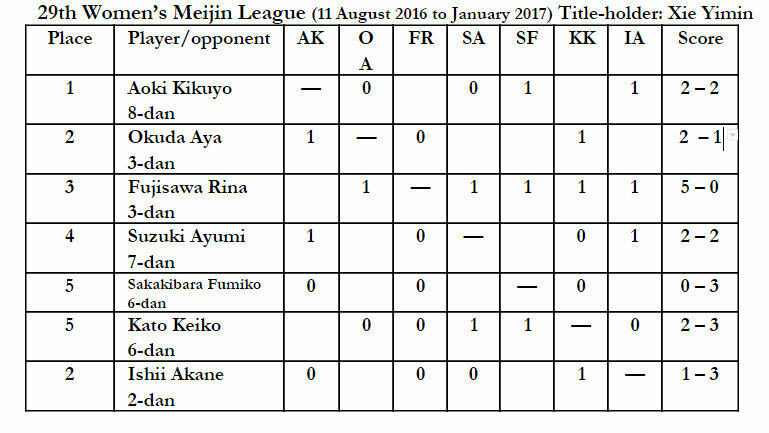 The three vacant seats in the new Meijin league have been decided. On November 3, playing black, Sakai Hideyuki beat Uchida Shuhei 7P, who had dropped out of the 41st league, by half a point. Sakai returns to the league after a gap of three years. On November 7, Hane Naoki 9P (W) beat Ichiriki Ryo 7P by 1.5 points. Hane regained his place immediately after dropping out of the previous league. On November 10, Yo Seiki 7P (W) beat Hirata Tomoya 7P by half a point. Yo will make his debut in the league. Hirata played in the previous league, but just missed out on regaining his place. He played an adventurous opening, with his first move on the 15-5 point and his third move on the 9-5 point, but Yo kept his nerve. The Kansai Ki-in has three players in the upcoming league: Murakawa Daisuke, Sakai, and Yo. The first round will be played in December. 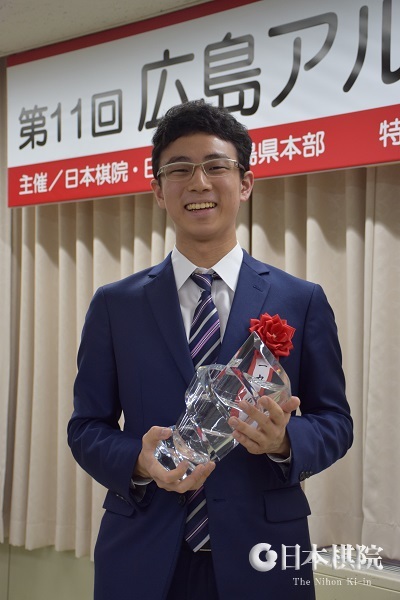 72nd Honinbo League: The first round in the new league was completed on October 20 when Hane Naoki 9P (W) beat Takao Shinji 9P by resignation. Two games in the league were held on November 3. Ko Iso (W) beat Yamashita Keigo 9P by resig., and Cho U (B) beat Mitani Tetsuya 7P by resig. On 2-0, Cho holds the provisional lead, but Motoki Katsuya 7P and Hane Naoki 9P, who are on 1-0, could catch up. and recently his promise has been converted into concrete results (see my report on his winning the Ryusei). This title match would be his biggest test so far. The first game of the 42nd Tengen title match was played at the Kashikojima Hojoen inn in Shima City in Mie Prefecture on October 21. The challenger drew white, and the game became a contest between Ichiriki’s attack and Iyama’s survival skills. 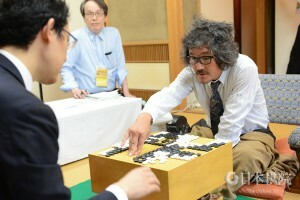 In the middle game, Iyama landed a fierce counterpunch, backed up by deep reading, and at one stroke secured the lead. 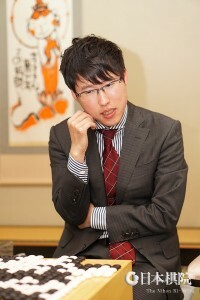 Ichiriki resigned after Black 139. This was Iyama’s fourth successive win over the three title matches he was engaged in. He seemed to have recovered from his slump in the first half of the Meijin title match. The second game was played at the Otaru Asari Classe Hotel on November 11, with Ichiriki playing black. The game was fiercely competitive, starting with a ko fight in the opening. Iyama made a miscalculation late in the middle game and resigned after 205 moves. Ichiriki evened the score and showed he posed a threat to Iyama’s sextuple crown. Iyama increases lead in Oza: The result of the first game of the 64th Oza title match was given in my previous report, but I have some more details below. 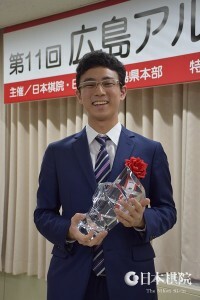 Challenging the 27-year-old Iyama was the 21-year-old Yo Seiki (Yu Zhengqi in Pinyin), the top player of his age group (low 20s) not only at the Kansai Ki-in but in Japan as a whole. Yo, who had black, acquitted himself very well, and the lead seesawed back and forth during some fierce fighting. After the macro endgame, the spectators all thought that Yo had the lead, but Iyama unleashed a devilish move that made the game tilt in his favor. He picked up a win by 1.5 points after 283 moves. The time allowance is three hours per player: both players were down to their last minute of byo-yomi (to which the last five minutes are allocated). Yu was satisfied that he had been able to go toe to toe with Iyama, but he will have to win games like this if he wants to take a title. 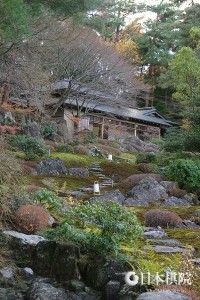 The second game was played at the Naka-no-bo Zuien inn, on November 7. Taking black, Iyama forced a resignation after 169 moves. Once again, Yo played well, and Iyama commented that he was quite worried in the middle game. In an interview after the game, he said: “With correct play by White, I might have collapsed.” The third game will be played on the 18th of this month. 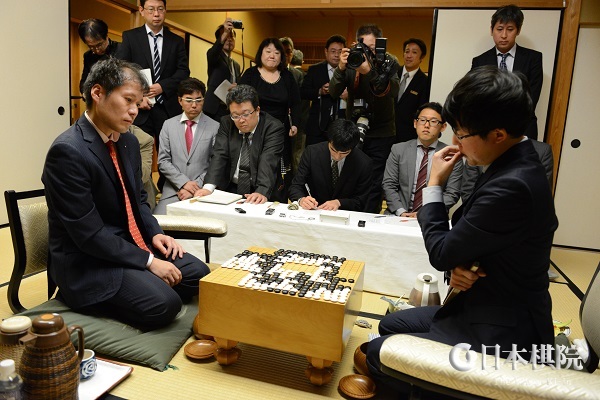 New Honinbo league starts: The 72nd Honinbo League got off to a start on October 6. Hane Naoki is back after a gap of four terms, so for the first time in a while the “the four Deva kings” (the others are Yamashita Keigo, Cho U, and Takao Shinji) who dominated Japanese go in the first decade of this century are together. In the opening games, Cho U 9P (B) beat Yamashita Keigo 9P by resig. and Motoki Katsuya 7P (B) beat Yuki Satoshi 9P by the same margin. Another game was played on October 13. League newcomer Mitani Tetsuya 7P (B) beat Ko Iso 8P by resig. Kono wins first Agon Kiriyama Cup: The final of the 23rd Agon Kiriyama Cup was held at Shakasan Daiboji temple, the Kyoto headquarters of the Agon Buddhist sect, on October 8. Taking white, Kono Rin 9P beat 25th Honinbo Chikun (Cho Chikun) by half a point after 220 moves. Cho had taken the lead in the middle game, but Kono played relentless endgame and pulled off an upset. This is Kono’s ninth title and his first Kiriyama Agon Cup. The play-off with the holder of the Chinese Agon Kiriyama Cup, Ke Jie 9P, will be held in Kyoto in December. Incidentally, this was the first clash between Kono and Cho for a title. First prize is five million yen. The first game of the 64th Oza title match was held at the Westin Hotel Osaka on October 17. Taking white, Iyama beat Yo Seiki 7P by 1.5 points. The second game will be played on November 7. 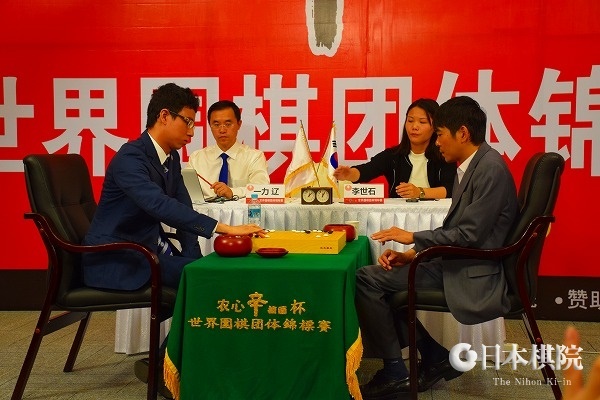 China wins Jastec Cup: This tournament was founded in 2012, but this is probably my first report on it. The full name is the Jastec Cup International New Stars Igo Tournament. It is open to eight-player teams, including two women players, from China, Korea, Chinese Taipei, and Japan. It’s an all-play-all team tournament, so a lot of games are played. It was held at the Belle Salle Iidabashi hall in Iidabashi in Tokyo from September 23 to 25. The sponsor, Jastek, seems to be one of the leading software companies in Japan. Ichiriki Ryo 7P is very busy this year, as he is studying at Waseda University. 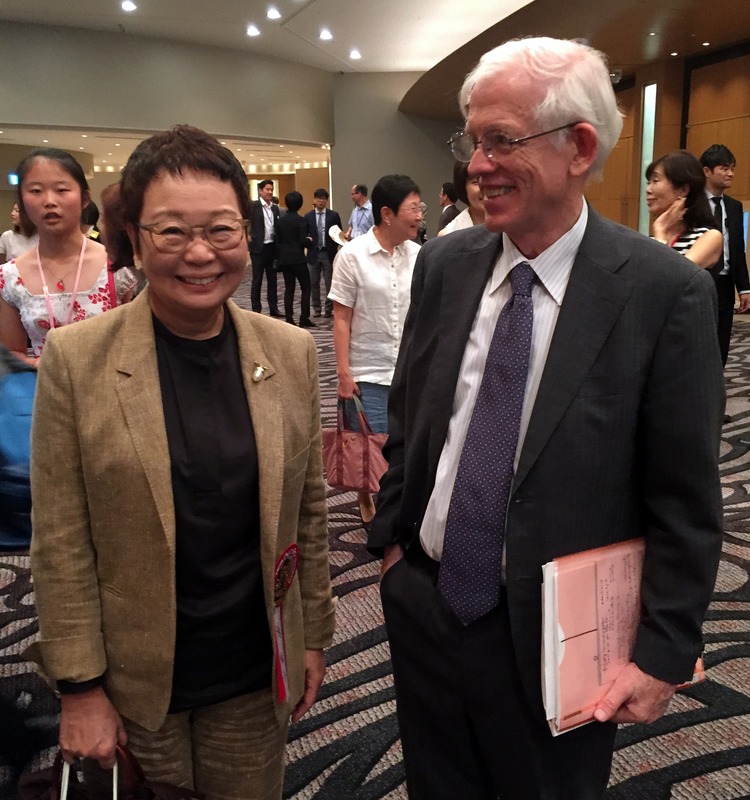 He attends classes by day (five 90-minute classes on his busiest day) and goes to the Nihon Ki-in at night. His hectic schedule is not affecting his play, however: he has just won his first open title (see previous report) and is about to challenge Iyama for the Tengen title. Game 1 (Sept. 27) Ichiriki 7P (Japan) (W) beat Yi Sedol 9P (Korea) by half a point. Game 2 (Sept. 28) Fan Tingyu 9P (China) beat Ichiriki by resig. Game 3 (Sept. 29) Fan (W) beat Lee Tonghoon 9P (Korea) by resig. Game 4 (Sept. 30) Fan (B) beat Cho U 9P (Japan) by resig. Fan is 20, just one year older than Ichiriki. When he was 16, he won the Ing Cup. The venue for the opening round was a little out of the way: a Nong Shim factory (Nong Shim is a Korean company) located in China near the borders with North Korea and Russia. The visiting players first stayed a night at Incheon in Korea on the 25th, then flew to Yuanji Airport in China on the 26th. From there it was a three-hour bus ride. The factory makes mineral water, using the local White Mountain Water. the 21st century. The second round and the quarterfinals were held on October 4 and 6. Pairings in the semifinals will be Tuo Jiaxi 9P (China) vs. Fan Yunruo 5P (China) and Yi Sedol 9P (Korea) vs. Ke Jie 9P (China). The semifinals, which are best-of-three matches, will be held in Taejon City, Korea from October 31. This tournament is the international version of a domestic tournament for younger players (30 and under) (see my report around June 21). It is open to five-player teams from China, Korea, Chinese Taipei, and Japan and the international version was held for the third time this year. Teams are made up of three male and two female players. The venue was the Temple & Shrines Hall, Ise City, Mie Prefecture. Results follow. Prizes are quite substantial for a junior tournament like this. First: 4,500,000 yen; 2nd: 1,500,000 yen; 3rd: 1,000,000; 4th: 750,000. There are also individual prizes for players with three (300,000) or four (500,000) wins. 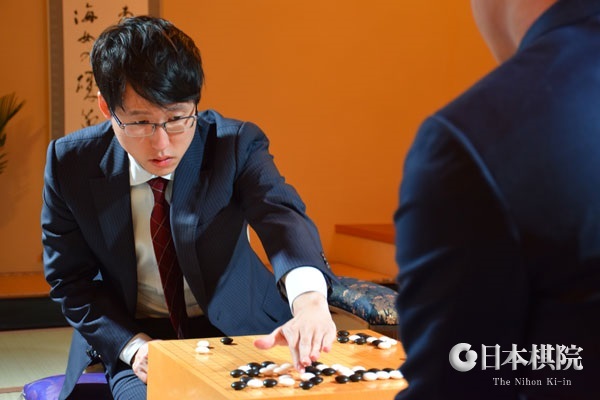 Iyama Yuta faced a very important game in Game 4 of the 41st Meijin title match: his first kadoban (literally, a “corner game,” that is, a game that could lose a series). For the first time ever in his career, Iyama (right) had suffered successive losses at the beginning of a title match. Another loss would cost him not only the Meijin title but also put an end to his septuple crown after a little over half a year. resigned after 181 moves, Black was over ten points ahead on the board. The fifth game was played at the Atami Sekitei inn in Atami City, Shizuoka Prefecture on October 12 and 13. Taking white, Iyama won a closely-fought game by 3.5 points. With this win, Iyama seems to be coming out of his recent slump. However, he faces another kadoban in the sixth game, scheduled for October 26 and 27. Before then, Iyama’s Oza and Tengen defences will start, so he is going to be very busy. Ichiriki wins Ryusei: The Ryusei is a fast-go TV title run by an irregular system but culminating in a standard 16-player knock-out. The final of the 25th tournament was played between Iyama Yuta and Ichiriki Ryo 7P and telecast on September 26. During the opening and early middle game, Iyama (B) built a lead, but Ichiriki played a do-or-die move that triggered an upset. Iyama resigned after White 200. This was Ichiriki’s first win in a non-age-restricted tournament. He was 19 years one month old when the game was played (his birthday is June 10), so he became the youngest player ever to win this title. The previous record of 20 years two months was set by Iyama. This will give Ichiriki some momentum for his Tengen challenge to Iyama. First prize is 6 million yen. First, here are two results in the S League of the 41st Kisei tournament I neglected to include in my previous report. On September 15, Yamashita Keigo 9P (B) beat Ichiriki Ryo 7P and Kono Rin 9P (B) beat Yoda Norimoto 9P by resig. As a result, Ichiriki lost his share of the lead. On 4-1, Kono regained the sole lead. The final game in the S League was played on September 29. Takao Shinji 9P (B) beat Murakawa Daisuke 8P by resig. This was Takao’s first win to four losses, so it didn’t do anything for him except save some face, but it knocked Murakawa out of the running for first. Kono won the league outright, so he goes straight into the final “best-of-three” to decide the challenger. 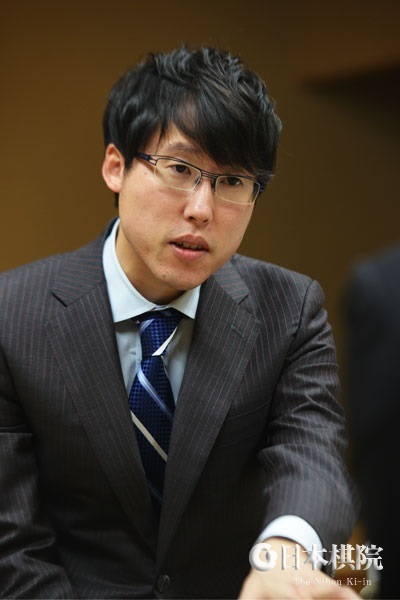 If Murakawa had won the above game, he would have won the league, as his higher ranking (#2) would have beaten Kono (#5). There was a three-way “tie” among Yamashita Keigo, Murakawa, and Ichiriki Ryo on 3-2, but league rankings meant that they came, respectively, second, third, and fourth. 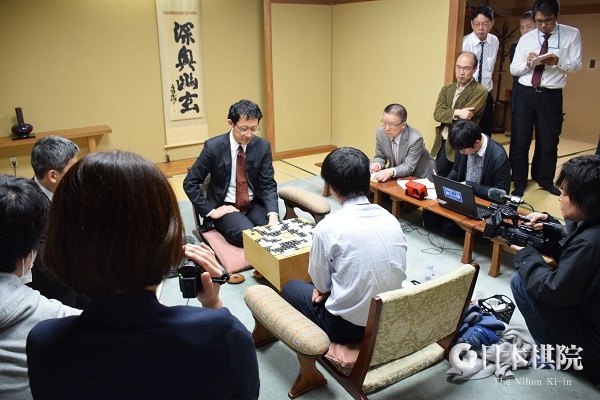 Yamashita’s second place secures him a seat in the knock-out tournament, so a fourth successive Kisei challenge by him is possible; he will need to win three games in a row. Takao and Yoda Norimoto lose their places in the S League. On October 3, the first game in the knock-out section was played. The B League winner Yuki Satoshi 9P (W) beat the C League winner Shida Tatsuya 7P by 1.5 points. The game was played on Yuki’s home ground, the Kansai Ki-in. The next game will be between Yuki and the winner of the A League, Cho U.
ke her. Black resigned after White 222. 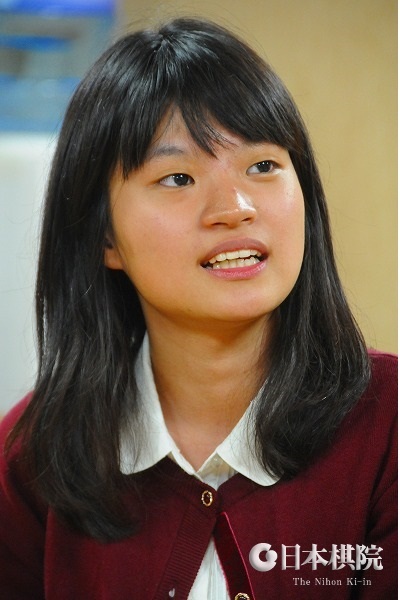 Last year Fujisawa Rina lost this title to Xie Yimin when she lost three games in a row after winning the first two. This time she started off with a loss, but recovered to take the next two. Can she now improve on last year’s performance? 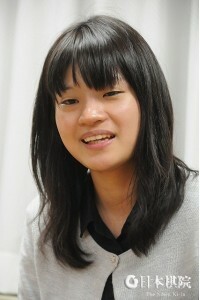 Fujisawa Rina has maintained her unbeaten record in the 29th Women’s Meijin League by winning her fourth-round game. Her closest rivals are Okuda Aya 3P on 2-1 and Suzuki Ayumi 7P on 1-1. (September 29) Ishii Akane 2P (B) beat Kato Keiko 6P by resig. (October 13) Fujisawa Rina 3P (B) beat Ishii Akane 2P by resig. ; Kato Keiko 6P (B) beat Sakakibara Fumiko 6P by 7.5 points. The second game in the 41st King of the New Stars title match was played at the Nihon Ki-in in Tokyo on September 30. Taking black, Onishi Ryuhei 2P (right) beat Taniguchi Toru 2P by resig. after 227 moves. 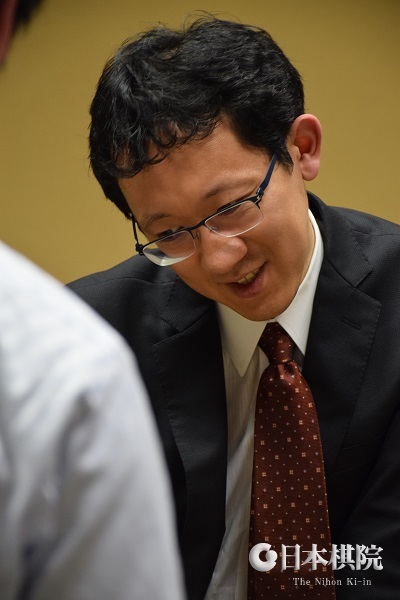 As in the first game, Onishi staged an upset late in the endgame. At 16 years six months of age, he becomes the youngest player to win this title. He is just in the second year of his career and was making his first appearance in the King of the New Stars.